Massachusetts may best be known for icons like the Red Sox and clam chowder, but today it’s the incentives for homeowners like you to invest in solar panel power that are making the Bay State stand out. There has never been a time when going solar was such a smart move as now. Massachusetts has a very strong and proactive statewide policy on solar power and comes out trumps with an almost bewildering number of ways solar installers are helped into saving money and saving the planet. Trust us when we say that whether you buy, borrow or lease a solar roof, you are never going to regret it if you live in Massachusetts. For every doubling of solar cell manufacturing globally, costs drop 20%. 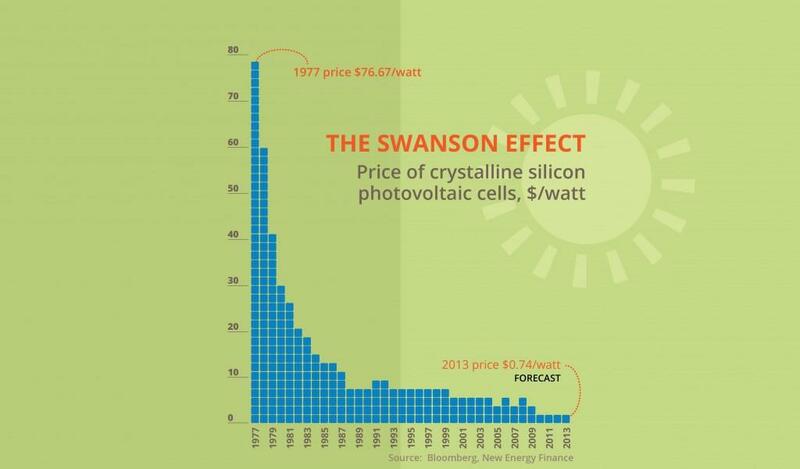 That is the Swanson Law, or the Swanson Effect, named after the founder of a solar panel manufacturing company Richard Swanson, who first noticed the phenomenon. What it means for you is that solar doesn’t cost nearly as much as it did a few short years ago and that makes it easier than ever for you to come out ahead with your own solar system. We’ll come back to all those goodies that Massachusetts hands out later, but let’s see how the different options for installing your own solar powered roof compare in the state. 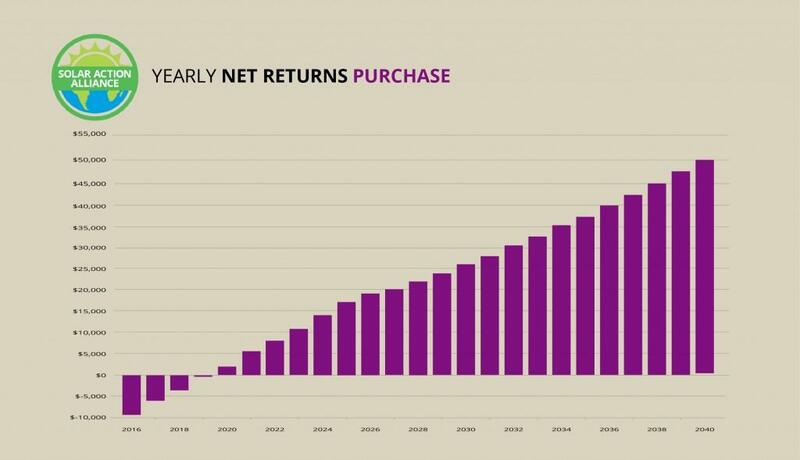 The graph below gives an overview of what you are likely to save over a typical 25 year period, which is the time most solar panels are guaranteed to operate at peak performance. 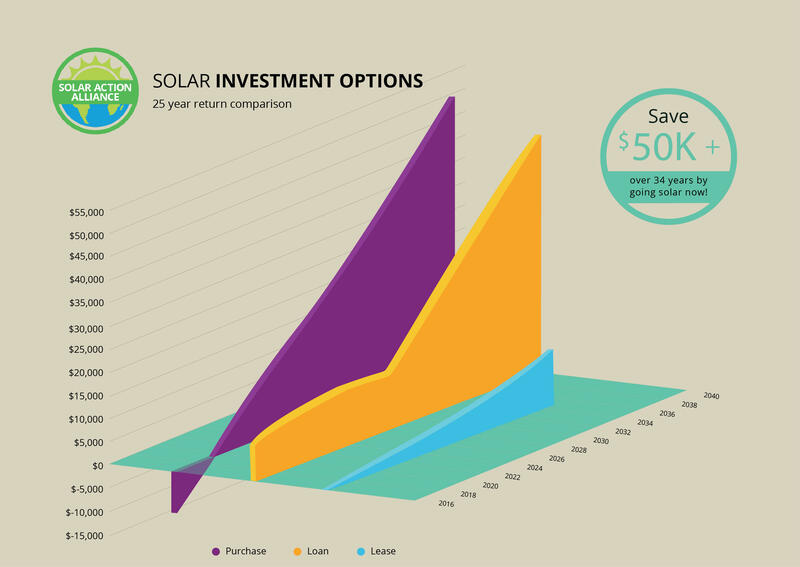 As you can see from the graph, buying your own solar panels is by far and away the best option in financial terms, but the catch is that you have to have the money upfront. Almost as good an option in the long run is taking out a suitable loan, such as a home equity line of credit (HELOC). That’s because of the bundle of incentives that both the state and the federal government hands out. And the beauty of taking out a loan is that you don’t need to spend a penny of your own money at the outset – but you get all the benefits after a relatively short period. If you don’t want to commit yourself to buying a solar set up but you would prefer someone else to take all the responsibility for the upkeep, then negotiating a lease is also a smart idea, even though it’s the least financially rewarding of all the solar options in the state. There are plenty of ways you can lease a solar roof as basically, you are allowing the use of your roof to the provider who charges you either by the month for the use of the panels or for the actual power you use. Whichever option you choose, you are the winner and it’s just a matter of how much you win! Don’t forget that Massachusetts has one of the highest electricity costs per unit of any state in the U.S., so any energy you can generate yourself is going to mean instant savings. And solar power never goes up in price, whereas all that electricity you buy from the utilities never goes down! We’ll look at each of those options in more detail before taking a peek at what makes Massachusetts such a great state to go the solar route. 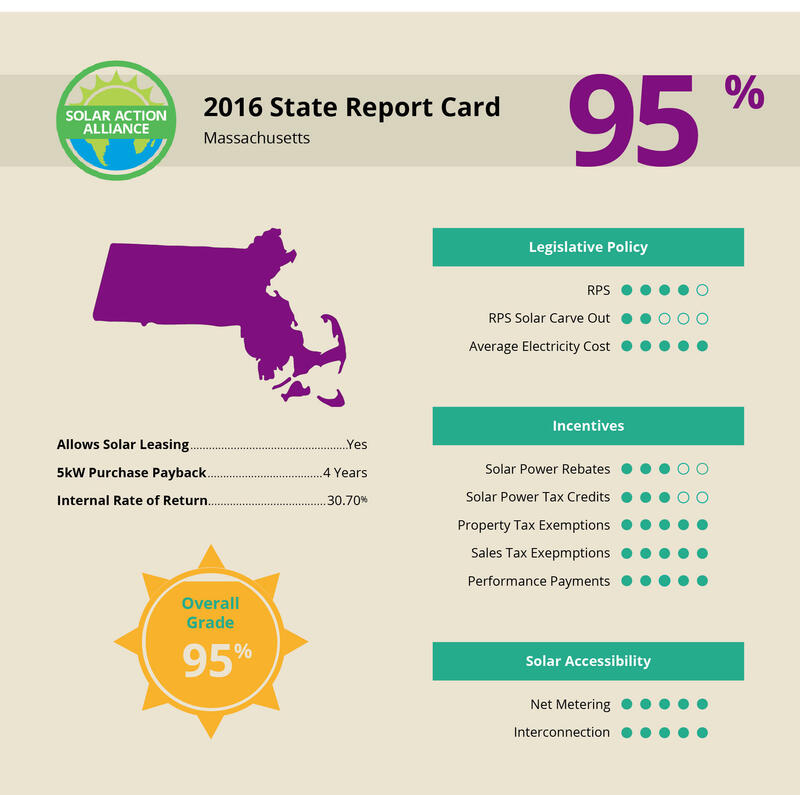 Buying your own solar system has never been easier in Massachusetts and it doesn’t matter whether you buy outright or take out a loan as you benefit from all those tax credits and other incentives that are available. The cash graph below shows this choice quite clearly. If you do have the cash to pay for a solar system, then you’re looking at around $19,000 for a typical 5kW setup. You might need more if you and your family are hungry for electricity or less if you’re not, but we’ll base our calculations on 5 kW. If the figures leave you confused, you can call us for a more detailed and easier discussion of what option suits you best. $19,000 may seem like a lot of money but when you factor in all the deductions it is a lot less daunting. First, the state gives you a $1,000 tax credit, so you can take that off the original cost, making it now $18,000. Then the federal government deducts a further 30% off the total in federal tax credits. That’s a deduction of $6,300 assuming, of course, that you have tax to pay. The bill now comes to $11,700. The incentives don’t stop there, because Massachusetts utilities will buy “solar credits” off you based on how much energy you generate. This is called the SREC (solar renewable energy credit) scheme and it’s only so generous because Massachusetts has such a progressive renewables policy. The utilities are forced into looking for ways of improving their overall renewable generation or they face a penalty. The easiest way for them to do that is to buy these credits off you as it demonstrates that they are attempting to achieve their RPS targets. The figures get a bit complicated here because it all depends on how much power your solar system generates throughout the year. For every SREC credit, you get paid around $285. A SREC unit is equivalent to 1 MW of electrical power produced by your panels and you can reckon on 5 to 6 MW being generated over a typical year if you have a 5kW system. So, every year, you could earn up to $1,600. That’s every year your solar panels are providing you with clean, non-polluting, free energy! It doesn’t stop there. Massachusetts has no sales tax on solar systems, so that makes it cheaper than if you had to pay out the tax. Then there are the savings on the power you produce. Don’t forget, Massachusetts has expensive electricity which is on average, $0.21/ kWh, so any power you generate by your solar setup will save you plenty of dollars. Exactly how much you save on power bills depends on what you consume of course and how much your solar panels are churning out, but let’s say for the sake of these calculations it averages out to $1,200 a year. Put all those figures together and it means that you will have paid out $8,500 by the end of the first year, but every year after that you will be earning $2,700 as a minimum (the ordinary power bills are likely to go up while your solar costs remain the same). In another four years, you will have paid off the entire cost of your solar setup and you still have 20 years of life left with your panels meaning that you could make more than $50,000 in that time. When you opt to lease a solar system in Massachusetts, you are allowing a solar provider the use of your roof to install their own solar panels. You benefit in the long run because you won’t have to pay for any of the installation costs and you won’t have to worry about having to maintain the system once it is installed as that’s all the responsibility of the provider. To be honest, there is normally very little maintenance needed on solar setups, apart from an occasional cleaning, but it’s great to know that if anything goes wrong you don’t have to worry about it. 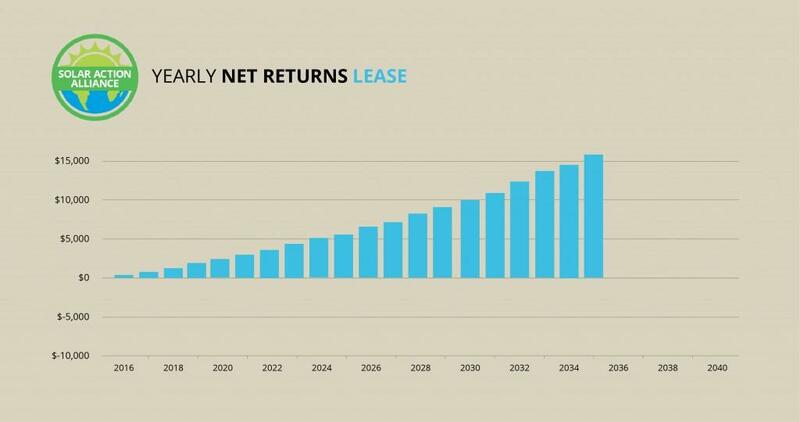 Leasing may involve you paying a monthly payment to the solar provider to use their panels or you can take out a power purchase agreement or PPA. Typically, the difference between them is that the first is based on the time period you use the panels, whereas the second arrangement is based on how much solar electricity you consume. You might now be wondering why this is such a good option at all and what’s in it for you? The answer is that whichever option you choose, the payments you make to lease the system are going to be less than what you would have had to pay for the electricity from your usual electricity provider. The savings you make might not seem huge, but over the long term, you can bet that normal non solar power electricity bills are sure to rise, so your savings will increase. And the very fact that your roof is powered from a clean, green source means that the environment is benefiting too! Buying a solar system with the help of a loan such as a home equity line of credit (HELOC), assuming you have some equity in your home, is as smart an option as buying it outright. In fact, there are many people who prefer to keep their money in their pocket and opt for a loan instead. You can then get your solar power installed without having to pay anything at all upfront and yet you gain from all those very same incentive schemes, tax breaks and other benefits you would get if you paid for everything outright. This graph explains the credit option. You could earn credits from your utility company if you sell any surplus electricity to them when it’s particularly sunny. That’s because Massachusetts has what is called a net metering rule, which ensures that utility companies are required to monitor how much energy is going each way between your panels and the grid. They have to credit you with any power you produce as a surplus. And then, just to cap it off, you may not be prepared to sell off your solar power system independently, but it adds considerable value too your home. The added value is equivalent to how much the savings would be in the remaining lifetime of the system. Because of Massachusetts property tax exemption status for solar systems, this increase in the value of your home is not taxable! 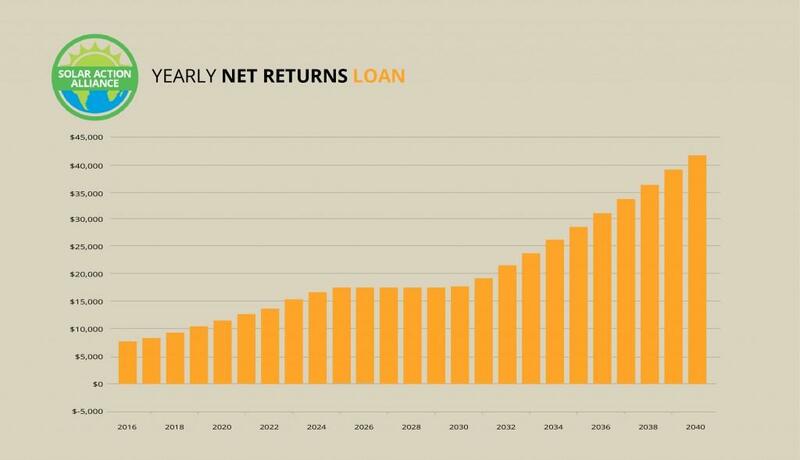 The only difference between taking out a loan and paying for a solar system outright is that you won’t make so much money as fast and it will take longer to pay off your solar. A typical HELOC loan would mean paying around 5% interest for 15 years. But as soon as you start to purchase your setup, you get all the benefits of ownership, such as the federal and state tax credits and the SREC payments. Because the savings on electricity bills are higher in Massachusetts than many other states where electricity is cheaper you should find that your savings are higher in value than your repayments. You should have paid off your solar system after 10 years rather than 5 years for the outright purchase and the next 15 years, the savings and credits are all yours as well as the increased value of your home if you decide to sell up. Massachusetts has a very progressive RPS policy, despite the fact that it doesn’t have the sunshine that some other states get. In fact, it’s funny to think that some of the cloudiest states like New Jersey, Connecticut and New York have much more solar friendly policies than some of the southern states like Florida, Mississippi and Texas. So, what’s so important about a state’s RPS? 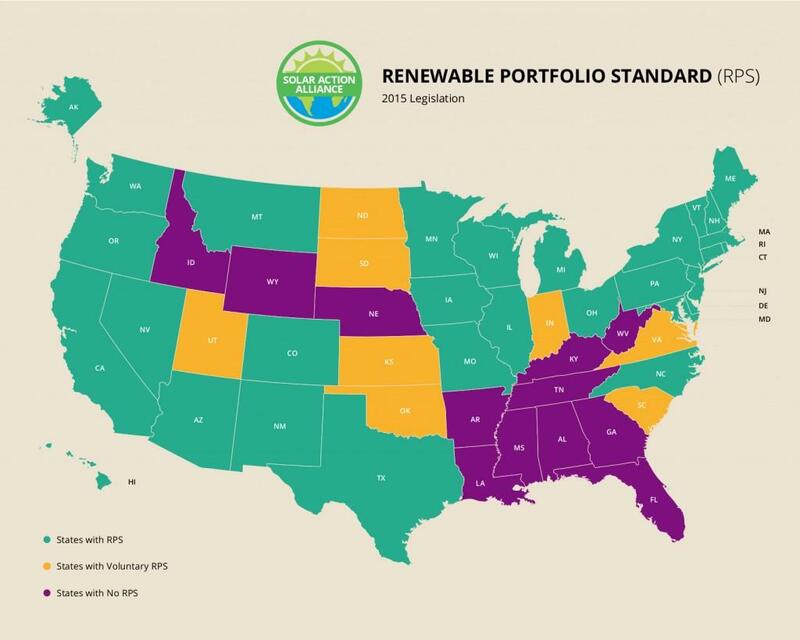 RPS stands for “Renewables Portfolio Standard.” It basically establishes the goals for the state in terms of renewable energy production and is designed to shift a fossil fuel hungry nation away from burning coal, gas and oil. Massachusetts has a relatively modest RPS of 15% by 2030, but it’s a whole lot better than states like Louisiana which has a zero RPS. New Jersey weighs in with 22.5% by 2021 which is much more ambitious and California leads the pack with 30%. The reason the RPS percentage is so important is that it forces the utility companies in each state to look for ways of generating power by using renewables like wind and solar. If they don’t they stand to pay huge fines. One of the easiest ways for these companies to achieve their targets is to offer incentives for you, the homeowner to install a solar roof. Don’t forget these companies don’t really like you to generate your own electricity all by yourselves. They would far rather you pay them at 21cents a unit, but they have to unless they pay the fines imposed by the state. States with a high RPS are favorable to both the solar industry and the homeowner who wants to go solar. The benefits available in Massachusetts all basically stem from a positive attitude towards renewables in general and solar in particular. The sales tax exemption, the state tax credit, the property tax exemption for the solar roofs already installed – all these have already been mentioned in some detail above and amount to a strong incentive for anyone in Massachusetts who has the right roof shape and area.